ocated on Manhattan's Upper West Side at the intersection of West End Avenue and 92nd Street, NY LifeSpring LLC is convenient to both private and public transportation. We are just a few blocks from the 95th/96th Street exit of the West Side Highway. Heading northbound on the Highway, take the exit at 95th Street. Heading southbound, the 96th Street exit ramp loops underneath the Highway and exits at 95th street. Go straight through the light at the end of the ramp for 1 block to West End Avenue, then turn right and continue to 92nd Street. There are parking garages west of Broadway on 94th, 95th, 96th & 97th Streets. 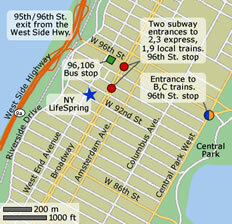 We are also only two blocks from the south entrance of the Broadway and 96th Street subway station. Two express trains, the 2 and 3, and two local trains, the 1 and 9, stop there, while the B and C trains stop at 96th and Central Park West. In addition, the 96 and 106 bus lines cross Central Park and stop on 96th Street between West End Avenue and Broadway.